Is iTunes On The Way Out? The top 1 percent of bands and solo artists now earn about 80 percent of all revenue from recorded music, as I wrote in “The Shazam Effect.” But the market for streamed music is not so concentrated. The ten most-popular songs accounted for just shy of 2 percent of all streams in 2013 and 2014. That sounds crazy low. But there are 35 million songs on Spotify and many more remixes and covers on SoundCloud and YouTube, and one in every 50 or 60 online plays is going to a top-ten song. With the entire universe of music available on virtual jukeboxes, the typical 3.5-hour listening session still includes at least one song selected from a top-ten playlist that accounts for .00003 percent of that universe. 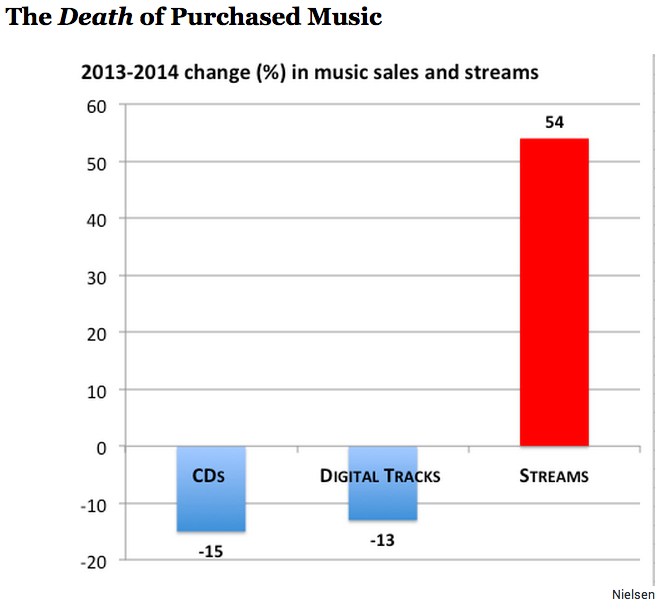 The long tail of digital music is the longest of tails. Still, there is a fat head at the front.